Ryanair will operate a new weekly service to Tenerife every Thursday during the forthcoming winter season from Ireland West Airport it was announced today. 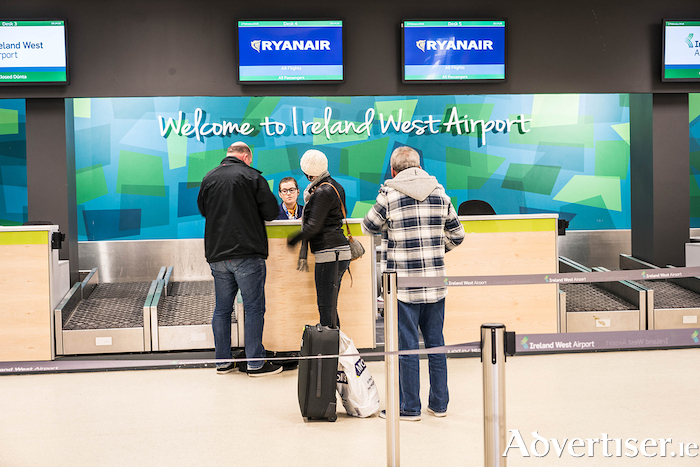 Commenting on today’s announcement, Joe Gilmore, Managing Director, Ireland West Airport said: "We are delighted to welcome the news that Ryanair will operate a new weekly service to Tenerife during winter 2019/20. "This will be a major boost for our winter schedule and will be the second weekly winter service to the sun drenched Canary Islands, in addition to our weekly Lanzarote service with Ryanair. "This will come as welcome news to our loyal customers in the West, North West and Midlands regions of Ireland providing even more choice and low fares to the Canary Islands during the winter season." Ryanair’s Kenny Jacobs said: "We are pleased to launch our Irish winter schedule 2019. Irish customers and visitors can now book seats as far as March 2020 and enjoy our latest customer care improvements, so there’s never been a better time to book a low fare flight with Ryanair. To celebrate, we are releasing seats for sale from just €14.99 for travel in March and April, which are available for booking until midnight Thursday (28 Feb ). Since these amazing low prices will be snapped up quickly, customers should log onto www.ryanair.com and avoid missing out." Tenerife is a hugely popular holiday destination and it’s easy to see why with dozens of great resorts to choose from. From the well-known resorts of Playa las Américas and Los Cristianos, the stunning cliffs at Los Gigantes to the pine forests in the national park.